In every young person’s life, there comes a choice. Join the forces of good and justice and become an agent of S.H.I.E.L.D. or give in to the darkness and enlist in the army of Hydra. At least that’s the direction my life took. 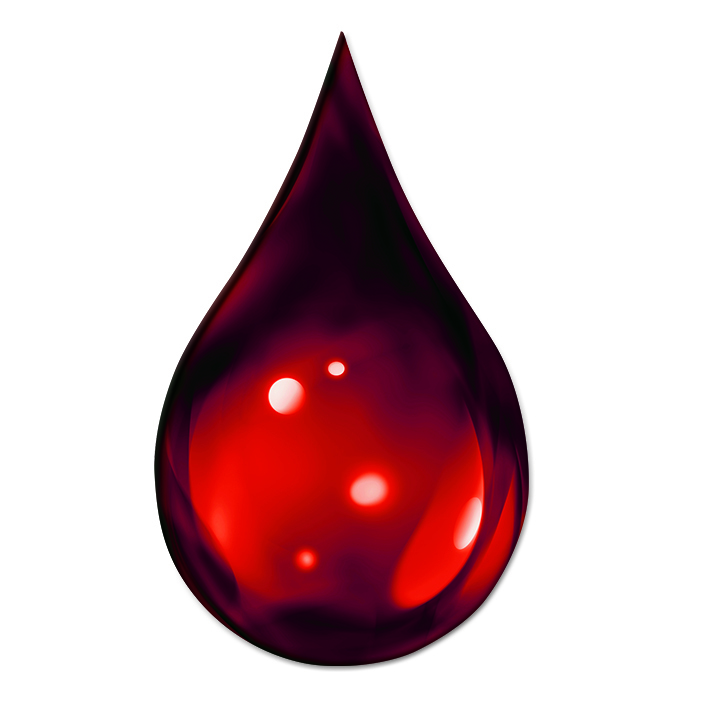 (You can decide which choice I made.) But enough about a faceless narrator, let’s get to today’s previews for the Crossover 2018 Issue for the VS. System 2PCG! Don’t drink coffee around him, I guess. What’s that? You heard a cool tweet? She was probably just copying someone else’s tweet – just like Espionage sort of copies Agent. Get some original ideas Bobbi! Speaking of S.H.I.E.L.D., although Nick Fury gets all the attention, there is someone else who is perhaps the true heart of S.H.I.E.L.D. 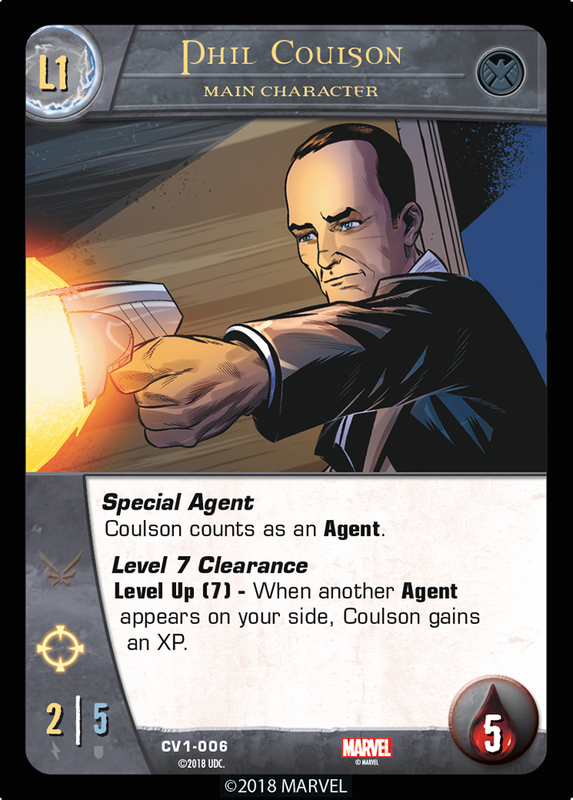 Please note that for a character with more than one instance of Agent, both instances count for Level 7 Clearance and I’m a Guy With a Plan. And Coulson does count himself for his Level 2 power – after all, he is the one with the plan. But will Hydra stand by silently, while a million Agents appear willy-nilly? They will not! They will do something strange, with their robot-man-brain-guy! 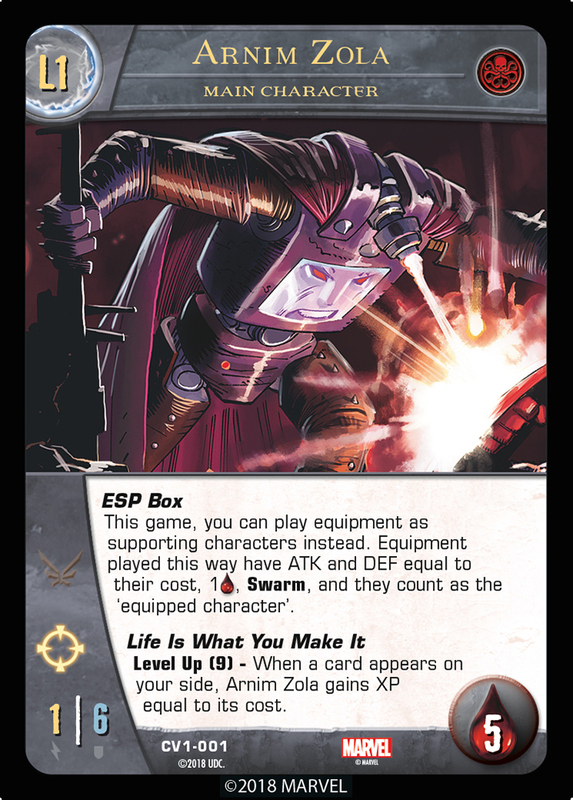 ESP Box takes effect once the game starts and lasts the whole game (even while Arnim is stunned, after he levels up, and even after he is KO’d). With it, you can play any equipment as a supporting character, regardless of whether you have a character with a matching team affiliation. 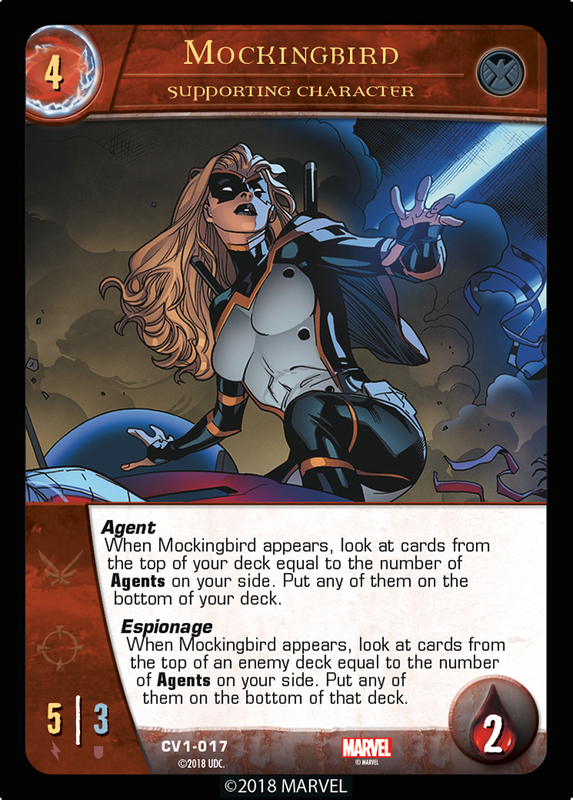 When you play an equipment card as a supporting character, it’s no longer an equipment. If it has a power that references “equipped character,” it is its own equipped character. When the card leaves play it will go back to being an equipment. You may still play an equipment normally and equip it to one of your characters (including on an equipment card that you played as a supporting character). Isn’t it grand? Here’s an example: Imagine Arnim Zola stole a Quinjet, then gave it a mind of its own. 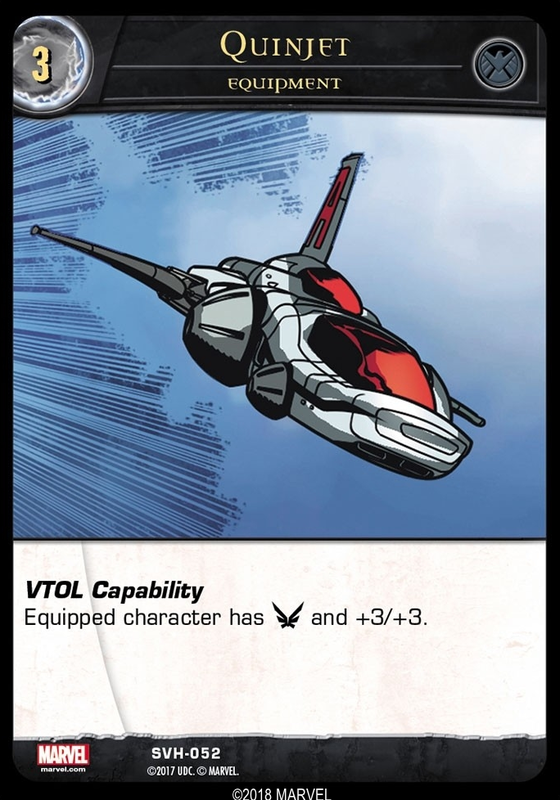 The Quinjet would be a 3-cost, 6/6 supporting character with , Swarm, and 1 . But wait, there’s more! When Zola enters A New Robot Body, your new equipment-turned-main character will have ATK/DEF equal to its cost, 1 [HEALTH SYMBOL], Swarm, and it will count as its own “equipped character,” just like with ESP Box. When that body gets KO’d, it can use this power again to jump into another robot body, and so on. 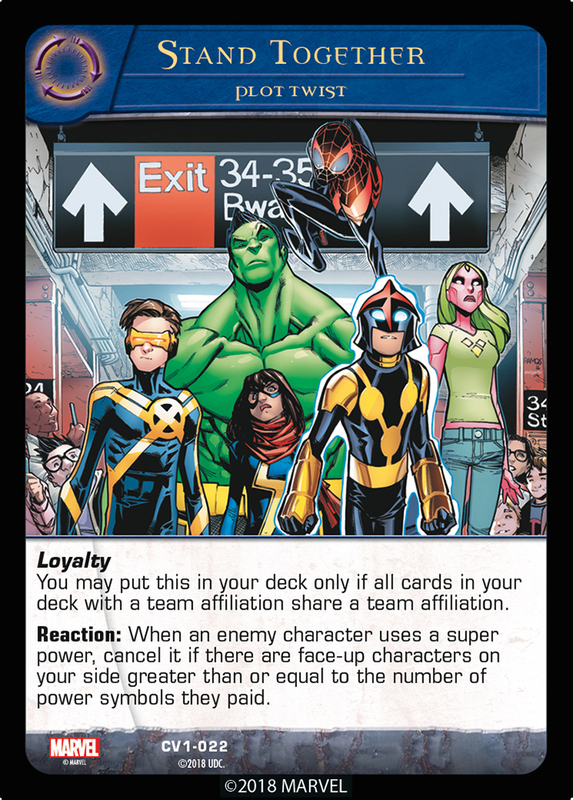 Note that if you want to use a Wild special location to pay for this power, it must match the team affiliation of the main character using this power. This is our first Reaction Plot Twist. Here’s how it works; when an enemy character uses a super power, after they pay any required power symbols, you can play Stand Together to cancel it before it takes effect. You must have at least as many face-up characters as the number of power symbols they paid. (If they paid none, then you don’t have to have any face-up characters. Chimichangas are easy to stop.) Wicked! But as they say, teamwork makes the super powers not work! 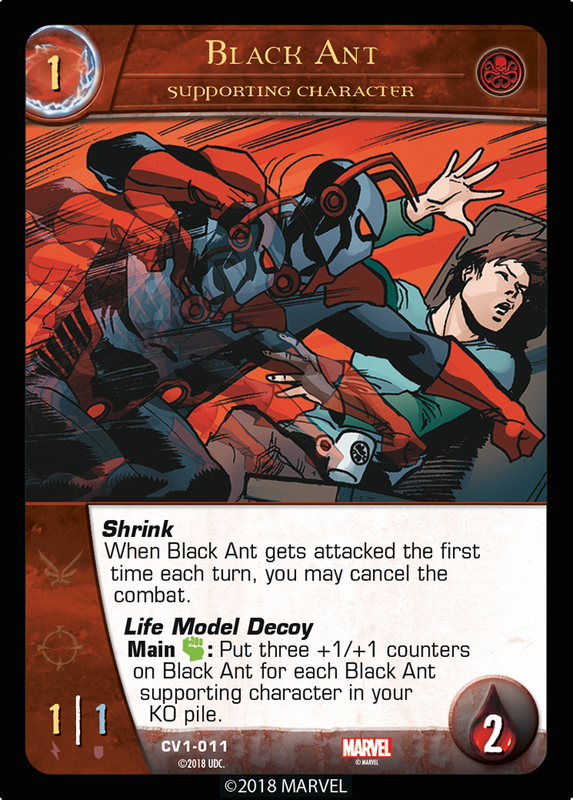 Join us next time for a preview article dedicated to just one card, the most epic card we’ve ever made!